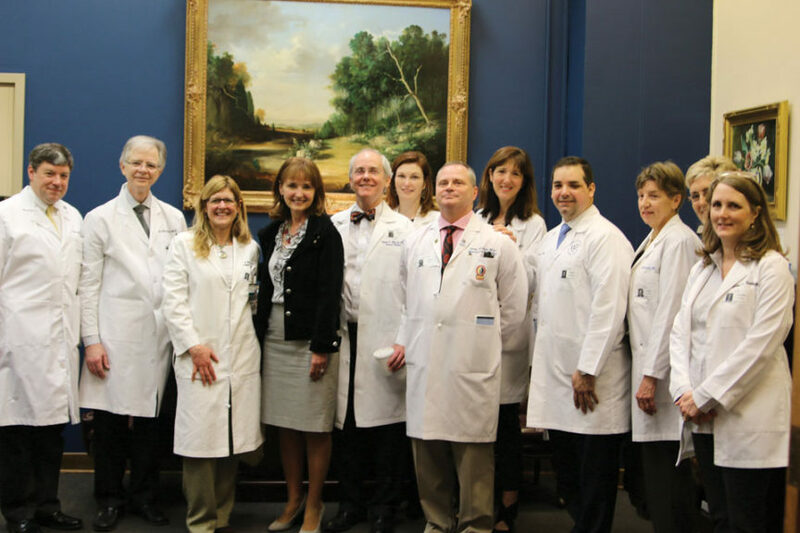 Nashville Academy of Medicine members pictured with Beth Harwell, Speaker of the House in the Tennessee House of Representatives. Eight presidents of the American Medical Association and 47 presidents of the Tennessee Medical Association trace their roots to the Nashville Academy of Medicine (NAM). These state and national leaders are indicative of the quality of medical leadership in the Nashville community. No other city in the United States can claim this many AMA presidents. 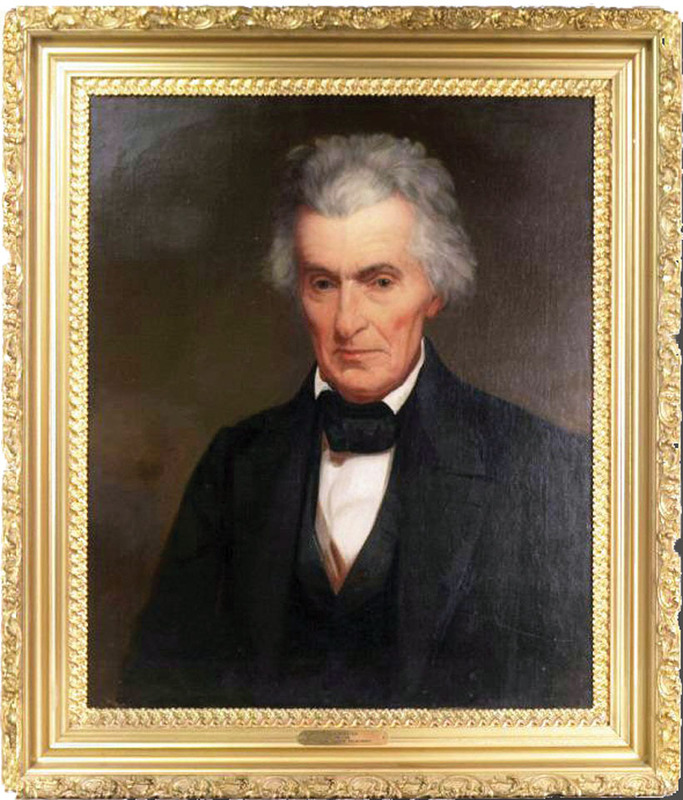 The first president of the Academy was Dr. Felix Robertson, who not only practiced medicine in Nashville for 40 years, but also served as mayor of Nashville for two terms. Since its founding in 1821 in a log courthouse on Nashville’s Public Square, NAM has served as the voice of physicians in the local community, maintaining the integrity of the medical profession and ensuring that physicians can continue to provide patients with excellent care. Portrait of Dr. Felix Robertson of Nashville, Tennessee by Washington Bogart Cooper (1839). Dr. Robertson was the first president of the Nashville Academy. From the initial seven physicians who came together to found the organization when Nashville was only 15 years old, NAM now lists more than 2,000 members. 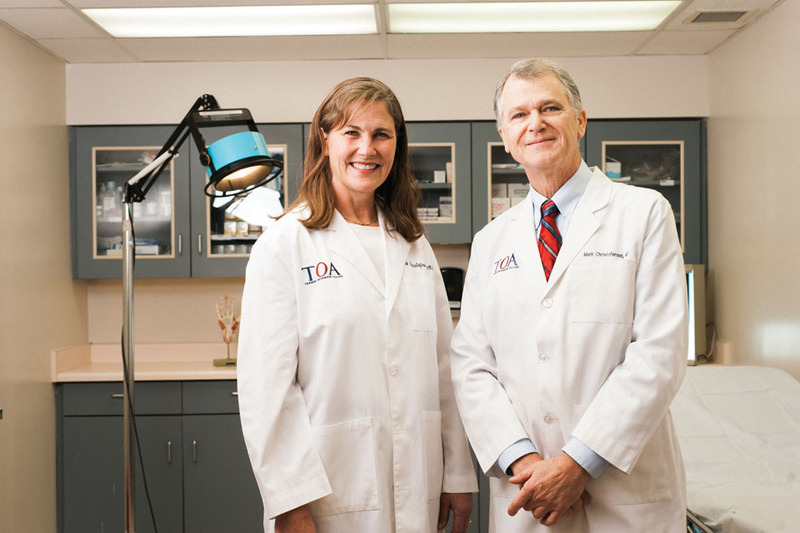 The goal of the founders remains the focal point of the Nashville Academy of Medicine today – to maintain high standards of medical practice, professionalism and ethical conduct, promoting the common interests and unity of physicians in the local community, and providing representation and advocacy for patients and physicians at all levels of government and medicine. Academy members represent 70 fields of practice, all local hospital medical staffs, the faculties and administration of Nashville’s two medical schools, local and state health departments and boards, and numerous health and paramedical agencies and organizations. 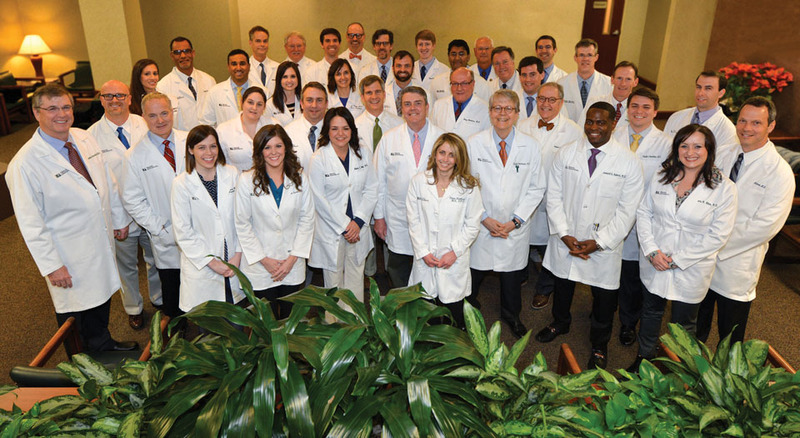 Many of the largest physician groups in Middle Tennessee are proud to have 100 percent of their physicians committed to membership in the Nashville Academy of Medicine. Some of these groups include Anesthesia Medical Group, The Colorectal Center, Goodlettsville Pediatrics, Heritage Medical Associates, Nashville Fertility Center, Nashville Gastrointestinal Specialists, Nashville Oncology Associates, Nashville Surgical Associates, Nephrology Associates, Plastic Surgery Center of Nashville, The Surgical Clinic, Tennessee Breast Specialists, Tennessee Oncology, Tennessee Orthopaedic Alliance, and Urology Associates. As the oldest medical society in Tennessee, NAM sponsors various programs and activities addressing physician health, practice health, and community health. The Nashville Academy of Medicine is one of the 25 largest local medical societies across the United States. The Academy is also one of the two largest local medical societies in Tennessee alongside the Memphis Medical Society. For generations, the Academy’s strength has been its support of doctors with propriety education, peer-to-peer networking, leadership training, legal resources, and other programs that help their members grow personally and professionally. Tennessee Oncology physician and Nashville Academy of Medicine member, Dr. Natalie Dickson speaks with a fellow physician. 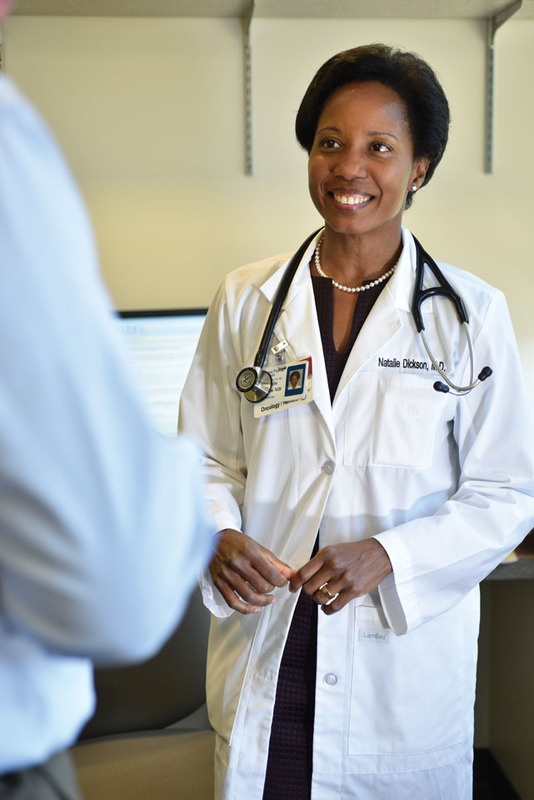 With offices in Davidson County in the heart of the region, NAM is uniquely situated to serve physicians within each major hospital system as well as private physicians across ten counties in Middle Tennessee. The services provided by the Academy have had a tremendous impact not only on medical practitioners, but on the local community as well. Project Access Nashville Specialty Care, a program that is operated by the Nashville Academy of Medicine, was launched in March 2005 to create a system of specialty and hospital care for the uninsured in Nashville. Davidson County residents who are below 200 percent of the Federal Poverty Level and who have no access to insurance are eligible for the program. More than 1,100 individual specialist physicians have donated their time to see patients. Six hospitals have signed agreements to also serve these patients through the Project Access Nashville Specialty Care program when additional services are needed, such as access to an operating room or lab testing. Urology Associates is proud to have all of their physicians recognized as members of the Nashville Academy of Medicine. The impact of this program has been a substantial asset to the Nashville community. More than $34.5 million has been donated in specialty care alone by individual physicians and hospitals since the inception of the program, and more than 26,000 patient visits have occurred for specialty care needs. The program unites 23 clinics that serve uninsured patients at the primary care level, and the Nashville Academy works as a conduit to funnel specialty care needs through a coordinated and systematic process. 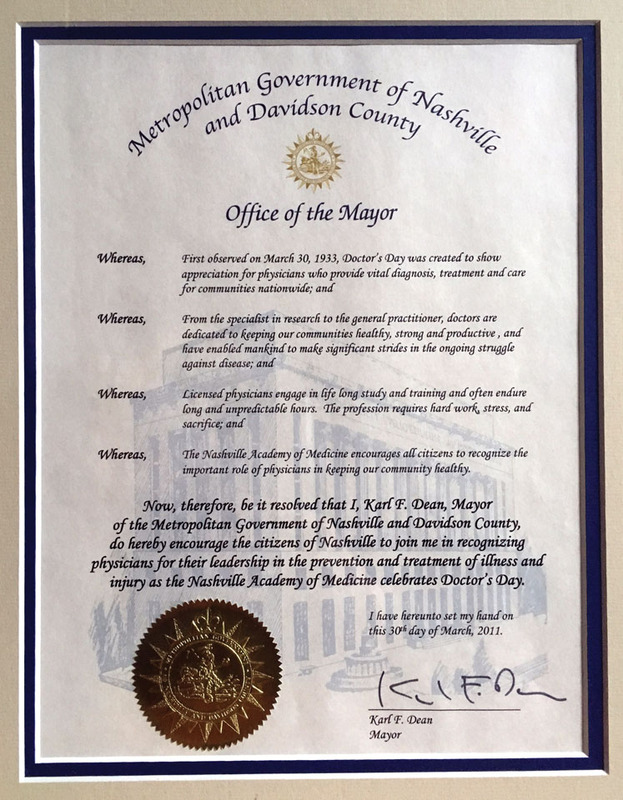 Resolution presented to the Nashville Academy of Medicine, signed by Mayor Karl Dean in 2011, recognizing March 30 as Doctor’s Day.